S. and G. Gross were Solomon Sidney Gross (1876-1935) and Gustav W. Gross (1880-1961). Solomon Gross appears in the U. S. Census of 1880, a 4-year-old, living downtown on Forsyth St. with his father, Emanuel Gross (age 36, born Hesse, Darmstadt), a furniture dealer, and his mother, Jennie Gross (age 33, born Baden). Both Solomon and Gustav appear in the U. S. Census of 1900. At that time they lived on Stanton St. with their father, Emanuel Gross (b. Germany, Dec. 1843, immigrated 1865), and mother, Jeanette Gross (b. Germany, Nov. 1850, immigrated 1865). Emanuel Gross's occupation was carpenter. Solomon is described as age 29, born New York, June 1870, Salesman. Gustav is described as age 17, born New York, August 1882, Bookkeeper. The birth dates in this census are pretty clearly incorrect. Solomon Gross registered for the World War I draft in 1918, when he stated that he was born 6 March 1876. Gustav Gross registered for the World War II draft in 1942, when he stated that he was born 14 September 1880. The sign gives 1901 as the date S. & G. Gross was founded. I found no entry earlier than 1908 for Sol S. Gross, pawnbroker, in the New York city directories. The business at that time was located at 2357 3rd Ave. (near 127th St.). The first date for 486 8th Ave. is 1918. In 1917 the New York Times (22 Nov. 1917, p. 18) reported a new incorporation: "S. & G. Gross Co., Manhattan, pawn brokerage, $30,000; A. Rodgers, G. and S. S. Gross, 2,041 Fifth Av." (2041 5th Ave. was Solomon Gross's home address in the late 1910s and early 1920s.) 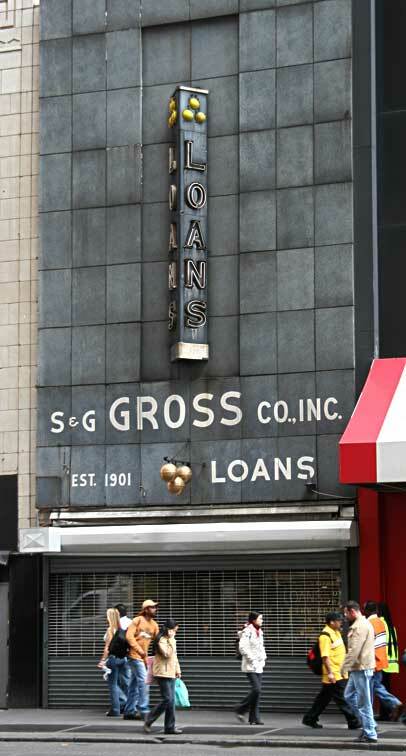 As of May 2008, S. & G. Gross were still in business at 486 8th Ave.
New York City Dept. of Buildings records show that alterations were made at 486 8th Ave. in 1917. There was also an electric sign application the same year. Very possibly it was at this time that the facade was altered to its present form.